Rotate the old bulb counter-clockwise to remove. 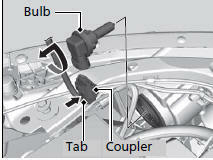 Insert a new bulb into the headlight assembly and turn it clockwise. Insert the coupler into the connector of the bulb.